A unique journey of discovering Jesus, the Jew, in today’s Israel is offered in a new book. 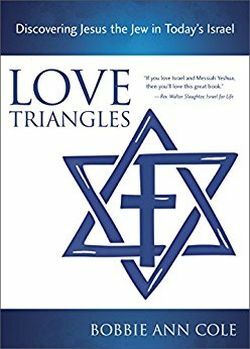 Bobbie Ann Cole, a Jew who found her Messiah in Jerusalem, turns tour guide as — with her pen in Love Triangles — she paints a fascinating picture of life in the Holy Land. Surprised and overwhelmed by the worship at a ‘Christian’ congregation in the nation’s capital, Bobbie subsequently committed her life to Jesus and was discipled at Holy Trinity Church, Brompton, in London. Her new-found faith so deepened her love for Israel that she made aliyah (immigrated to the Jewish state) with her new Canadian husband Butch. But in time they felt so uncomfortable and marginalised as Jews who followed Jesus that they retreated to their homes in the diaspora. Bobbie takes issue with the Israeli community in general over why Messianic Jews are treated as lepers — persecuted just as they were in the first century — particularly in view of repeated claims of freedom of worship being sacrosanct in the only Middle East democracy. Application forms for potential immigrants are now said to include ‘Messianic Judaism’ as an option to tick from a variety of branches of the faith. Although this appears to recognise Jewish believers in Jesus, it would seem instead to be a trap leading to rejection, she claims. Though, at some 20 000, still representing a tiny proportion of Israel’s population, the worldwide Messianic movement has seen exponential growth in recent years with estimates ranging as high as 350 000, roughly the number of Jews living in the UK today. On a positive note, however, Bobbie waxes lyrical about the beauty of the country and takes the reader on a guided tour to emphasise the Jewish roots of the Christian faith in light of the Tenach and how Jesus fulfils the Old Testament prophecies and Jewish feasts. She writes of how Christ can be traced throughout Scripture, even to Joseph interpreting the dreams of the baker and cupbearer — linking the baker, who was impaled on a pole, to Jesus’ crucifixion and the cupbearer, who was restored to his position, to the resurrection after the sharing of bread and wine at the Last Supper. 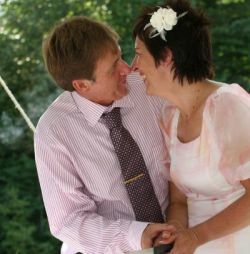 Bobbie Ann Cole and her husband, Butch on their wedding day. The author also demonstrates how an appreciation of the land and its history and culture throws new light on our understanding of Scripture and of Jesus himself, who walked the land in person 2 000 years ago and who comes alive in a deeper way as we retrace his steps from Bethlehem to Nazareth, Capernaum on the shores of Galilee and down to Jerusalem where he gave himself as the ultimate Passover Lamb before rising again and returning to his Father. And it is also the land to which he will return as the ‘Lion of the tribe of Judah’ (Revelation 5:5). This is a challenging and inspiring book that will deepen your faith in Jesus, the Jewish Messiah, who came to save the world and bring peace to those who seek it. Bobbie Ann Cole is also author of She does not fear the snow, the autobiographical story of a modern-day Ruth.